This gravity shake freezer features 5-flavor injections with no CO2 required, simply press a button! 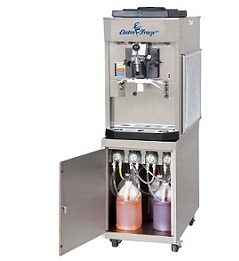 The easy-to-operate features include: Quick connections for vendor syrup bottles, easy syrup adjustments, and fewer parts to disassemble and clean. Great for high paced restaurants, ice cream stores, full-service frozen yogurt shops, family fun and amusement centers.